What Is Nuclear Energy? - An Often Asked Question These Days. What is nuclear energy is a more frequently asked question these days. nuclear radiation. In my country, Australia, proposals for increased mining and export of uranium and for the building of nuclear reactors, wax and wane. Elsewhere many are calling for nuclear energy as the answer to global warming. For various reasons you also are interested in that question, what is nuclear energy? If abatement of global warming is indeed the main reason for increased use of nuclear energy, then we need to be satisfied that it compares sufficiently well against truly renewable energy sources. Of course there are other reasons why people promote nuclear energy too. A first step in your exploration is to find out what is nuclear energy exactly. Or perhaps to find advantages of nuclear energy. And if you want to know about how does nuclear energy work, click here. So what is nuclear energy then? Well, nuclear energy was discovered accidentally in 1896 by a French physicist Henri Becquerel. He found that photographic plates that had been stored near uranium behaved as if they had been exposed to light. They became fogged. Marie Curie later discovered that ray emission by uranium was a property occurring in its very atomic structure. Radioactivity is the emission of very small particles and energy waves from the atom. Therefore atoms are not indivisible or unchangeable. They have smaller parts that can be rearranged. This brings you and I somewhat closer to answering your question: what is nuclear energy? Radioactivity from radium, thorium and other minerals, spread in the laboratories of these early investigators. This was because radioactive particles had turned into radioactive gas. This led physicist Rutherford and chemist Frederick Soddy to conclude that radioactive elements could spontaneously change into other elements. At each such transformation energy is released. And this is the decaying process, a chain of reactions. As radioactive elements spontaneously change into other elements they ceaselessly emit radiation, that is until the atom will yet again have become stable. This is the "chain reaction" that we have come to use as an expression meaning that from one small stimulus a long series of reactions follow. At every step of the nuclear chain reaction energy is emitted. But this is not yet a full answer to your question: What is nuclear energy? Is it? So, we know that vast amounts of energy are found within the tiny atom as a result of two nuclei or particles within the nucleus of an atom colliding and changing as a result of that collision. Two different nuclear products to the original products, before collision, are the result. Nuclear energy, as the term says, is released from the very nucleus of an atom. This happens as a result of its mass being converted to energy. This conversion happens according to Einstein’s famous formula E=mc², where E is energy, m is mass and c is the constant speed of light. But there is more before I have answered your question: What is nuclear energy? 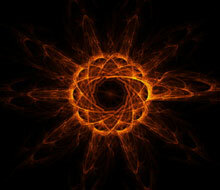 Fusion could be said to be the Holy Grail of nuclear reaction. It powers the sun. Hydrogen atoms are fused together to form helium and in that process energy is released. This process can only happen under very high temperatures where hydrogen becomes plasma where the negative and positive particles are separated. The positively charged hydrogen particles normally repel each other. But they achieve high speeds under such high temperatures and are able to fuse when collisions occur under these circumstances. Energy is then released. I compare fusion to the Holy Grail, because fusion is easy to achieve in the super-high temperatures of the sun and celestial stars, and under their great gravitational forces. It is not so easy on Earth. On Earth hydrogen, the fusion fuel, must be kept dense enough, and kept confined for long enough—for at least one second—to enable release of energy. Controlled fusion is about achieving enough reactions to occur to spark an ongoing chain reaction that will "run" spontaneously on hydrogen fuel, which is added during the reaction process. Its advantages would include the abundant availability of hydrogen and that it does not produce radioactive fission products. Some components do however become radioactive over the reactor’s lifetime and so radioactive waste would still be voluminous. However the radiotoxicity of these materials is relatively more short-lived than that of a fission process. Fission is the process of breaking the binding forces of an atom’s nucleus. In this process the nucleus of an atom is split into two or more nuclei, whereby a large amount of "free energy" becomes available. The split products are known as the "fission products". The fission process is used presently by all working nuclear reactors. Nuclear fission is certainly an tempting process to make energy available. This is because the free energy contained in nuclear fuel is millions of times greater than the free energy available in conventional fossil fuels such as in oil or coal. Just as emission products of fossil fuels are a problem, so there are problems with nuclear energy. The problem of radioactive waste is only one of these. Decay is the third nuclear process. It describes the natural process of the nucleus of an atom breaking down into a stable form. When that stable form is reached no more radiation is being released. When you hear talk about the "half-life" of radioactive materials, you are hearing about their decay. It is the time taken for half of a substance ‘s radioactivity to decay. For some this is measured in millions of years, for others in mere hours. is obviously a question that could be answered in much greater detail and complexity. However if you just want an overview then this is it. Now you have some knowledge to compare nuclear energy to truly renewable sources of energy. What is nuclear energy in essence? The question, what is nuclear energy? could also be answered by saying that it is the energy in the core of your being that keeps those around you warm. After all, that is what the quest for ever greater sources of energy is about, throughout human history. To harness eneregy to cook, to eat, to get around, and to stay warm. Physical and emotional wellbeing is one. Through a certain amount of fusion of your wellbeing with that of others, and that of the environment, we may find the Holy Grail of sustainable living. That will inevitably involve finding limits to our energy consumption and its purposes, rather than endlessly see "more" as equal to "better". As Einstein said himself: "You cannot solve problems with the same kind of thinking that caused them in the first place". Well, put another way, just a little too much fission, does not make the world go round! Only your attitude can. You want to know how does nuclear energy work or perhaps about various alternate sources of energy? See you on another page. Want to talk about nuclear energy and global warming? Go here. Want to know more to inform you in the nuclear energy debate? Like How Does Nuclear Energy Work Exactly? What's The Advantage Of Renewable Energy? You want to know more about what is nuclear energy or perhaps about various alternate sources of energy? See you on another page.